Mars 2005 Another part of Al-Qalamon mounts (middle of Syria), and another great view of this region which is rich with historical monuments and unique sights, Jaba3deen is one of the few left villages which its inhabitants still use Aramaic in their daily life. Aramaic is the language that Jesus Christ spoke 2000 years ago to spread his morals among people. As an important information, the inhabitants are Muslims, so it's not like most of us think, not everyone who speaks Aramaic or Assyrian should be a Christian. The village is so Close to Maloula and Rankous. 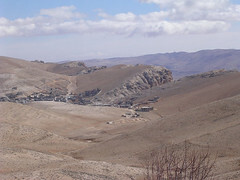 (45 km of Damascus).